Definition: The instrument whose working depends on the heating effects of the measuring current is known as the electrothermal or electrothermic instrument. This device is used for measuring the high-frequency current. The most significant advantage of this type of instrument is that it measures the high range frequency current more than the Moving Iron and an Electrodynamometer type instrument. At normal frequencies, the electrothermal instrument is used for the accurate voltage measurement. The Electrothermic effect is used in three ways for the measurement of the current. And according to these ways, the Electrothermic instruments are classified into three categories. The pointer of the hot wire, bolometer and the thermocouple instrument depends on the heating effects of the measurand current flows through the coil. These instruments use the thermal impact of a current differently. As the working of the electrothermic devices depends on the heating effect of the current, thus it is used for measuring both the alternating and direct current. 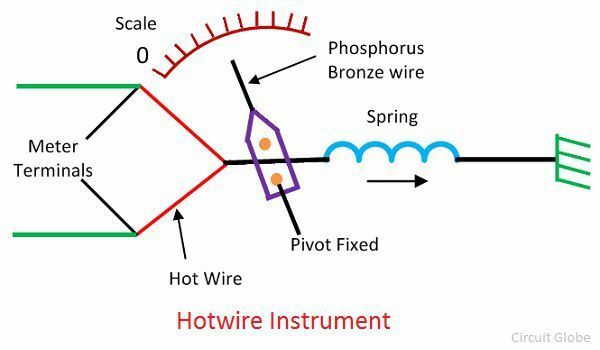 The hot wire instruments work on the principle that the current passes through the coil increases the length of the wire. The wire regains its shape with the help of the spring. The expansion and contraction of the wire will deflect the pointer of the meter. The increase in the length of the wire is equal to the square of the current passes through it. 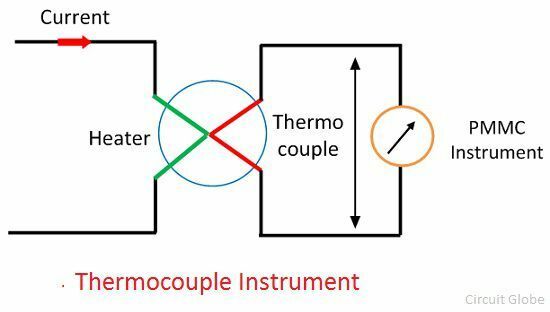 Such type of instruments uses the thermocouple which converts the heat energy into electrical energy which is easily measured through the meter. The measurand current passes through the junction of the thermocouples. The current produces the heats in the heater, which is connected to the thermocouples. The thermocouples convert the heat into an EMF which induces the current to passes through the meter. The bolometer uses the resistive element whose resistance varies concerning the temperature. The measurand current passes through the resistive element increases their temperature because of which the resistance of the element increases. The variation in resistance determines the magnitude of current passes through it.